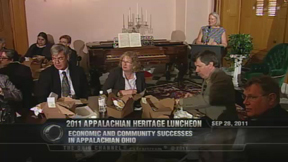 Heritage Ohio, Ohio's Hill Country Heritage Area, and Senator Tim Schaffer present the 2011 Appalachian Heritage Preservation Luncheon: Success in Appalachian Ohio. They are joined at the Statehouse by several community leaders to discuss how heritage programming can enhance economic and community success in Appalachian Ohio. Heritage Ohio, the leading statewide, not-for-profit preservation organization, exists to help people to "save the places that matter; build community; live better." In 2002, Heritage Ohio was designated as the statewide partner of the National Trust for Historic Preservation. Ohio's Hill Country Heritage Area, a non-profit, membership organization encompassing Appalachian Ohio's 31 counties, promotes heritage activities throughout the region and provides networking opportunities for individuals, organizations, and communities interested in the preservation and appropriate development of the historical, cultural, recreational, and economic resources of the region.